The form of Sunrisers Hyderabad has dropped significantly in the last couple of games as they have lost to both Mumbai Indians and Kings XI Punjab, and it has been their batting at the root of their issues if Bairstow and Warner are dismissed early. Their fragile middle order could be strengthened by the return of skipper Kane Williamson after injury and while that will mean Mohammad Nabi will be forced to miss out, it will make a huge difference to their batting line-up. They can also count on Khaleel Ahmed after injury to boost their bowling attack and make up for the absence of Nabi as the Sunrisers will be desperate to get the victory and return to the top four after recently dropping out. Delhi Capitals have some good momentum on their side coming into this match as they have won their last two matches chasing down totals set by Royal Challengers Bangalore and then Kolkata Knight Riders as they look to push on in their quest for a top four spot. They face Sunrisers Hyderabad who beat them just ten days ago in Delhi after they were restricted to just 129/8 and the Sunrisers managed to knock that off relatively comfortably so they know they will have to perform much better than that game. Keemo Paul came in for the match on Friday against KKR and he took two wickets albeit for an expensive 46 runs and there is a chance that Sandeep Lamichhane could come back into the bowling attack here. 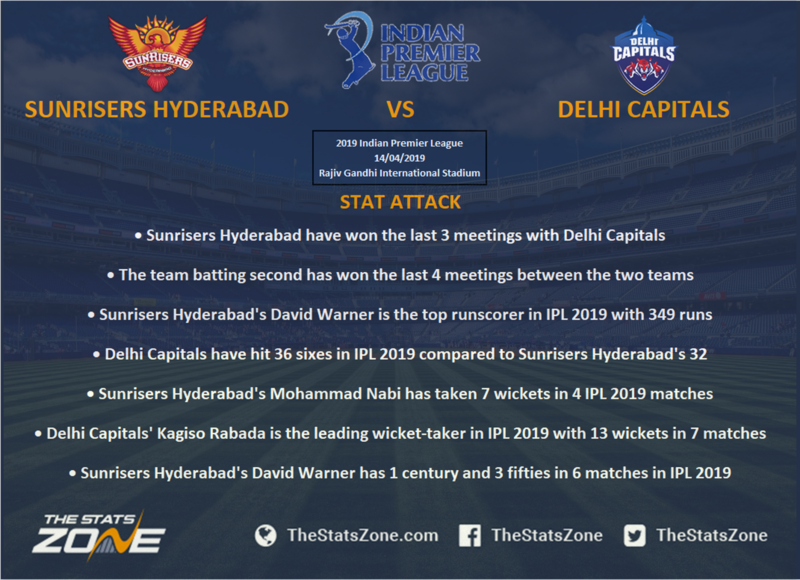 Recent performance of the two teams are certainly in favour of Delhi Capitals as they have won their last two matches while Sunrisers Hyderabad have lost their last two. That said, Sunrisers are notoriously strong at home and will take confidence from the fact that they beat the Capitals well just ten days ago in Delhi. Their bowling unit was excellent in restricting them to a low total, and their batsmen played well also so it is difficult to see much different here especially with home advantage on their side.